Malawi is known as the warm heart of Africa, and it has certainly stolen our hearts. Our trip has completely turned our world upside down! We are grateful for all of the support that you gave us both financially and through your prayers. In response to your support, we would like to provide you with a short recap of the trip with some of our most memorable moments. Below you will find our “top ten” list of the highlights of the trip. #8. The Welcoming. After nearly 40 hours of travel and very little energy left in us, we arrived at the Grace Center to the most beautiful welcoming. The children were running to meet us as we drove in! They then proceeded to attack us with hugs and singing. It was so genuine, and so warm...Definitely one of the best days of our lives! #7. Sunday Church. Both Sundays in Malawi we got to experience true church. 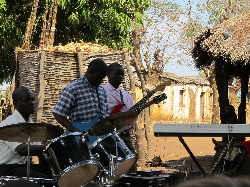 Church in Malawi is very different than here in the US. First off, it lasts anywhere from 4-6 hours long! You would think that would be painful, right? Wrong! The time flew by! The music was incredible and the people were so joyful to be worshiping their savior. Joey preached on the second Sunday we were there. He did an unbelievable job. So much so, that everyone called him “Abusa” (pastor) for the rest of the trip! #6. Soccer Time. Joey bonded very quickly with the older boys at the Grace Center. Every day, they begged him to play soccer with them. These extremely strong and fast boys played with no shoes and a ball that barely had air in it. But they didn’t care, they were as happy as can be to have their mnzanga (friend) playing with them! #5. Village Visits. We were given the opportunity to visit a village in Malawi and share the gospel. The homes were tiny shacks made of straw. But it didn’t matter, these families were so proud of their home. Joey and I both got the opportunity to pray with people who were hurting and afraid. We believe God worked to further his kingdom in those moments. #3. Lake Malawi. 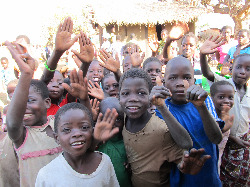 On the last day we were in Malawi, we took all 44 children who lived at the Grace Center to the beach. Some of these little ones had never seen water before! It was like Christmas morning for these children…So much pure joy and excitement on their faces. It was truly a beautiful day. #2. The Babies. There were 6 babies under the age of 2 at the Grace Center. Each day, I would head to “Patricia’s Home” to hold my babies. Clever, in particular, was a baby boy that I fell in love with. Clever had a hemoglobin of 3 (normal is 15) and consequently had very low energy and excitement. It was heartbreaking. Towards the end of the trip, I was able to see Clever smile for the first time… a memory I will never forget! #1. The Children. Needless to say, Joey and I fell in love with the children at the Grace Center. Between cuddling them, teaching them, praying with them and just simply loving them, our hearts are forever changed. In only two short weeks, we believe that God has made it very clear that we will be back to see our children again. We miss them every day, and it’s only getting harder, not easier. We are ready to give our life fully to Him. Here’s to a ride of a lifetime! Posted on August 15, 2013 by Karen Roller.